Hey! The book! It’s in the can! It’s been sent to the printer! You’ll be able to buy it soon for $10! It’s sixty-six pages of material, patient which means about a third of it will be all-new to you! We’ll have them for the Boston Comic-Con! Then we’ll sell them online after! Holy cats! It’s like we’re a grown-up thing! I have to admit…the Bruscetta Master intrigues me. I want all of these things, especially Jamstravaganza. Paul, was the Corndogger influenced by the Cornballer in Arrested Development? At first, I was afraid that once again, I would be denied further Guido-punching. But what you have given me here is a different, perhaps better, form of Guido-punching. Also, that montage of products? Brilliant. I feel the Bruschetta Master is a fully practical and valid invention. It takes all the guesswork out of bruschetta! Perfect bruschetta FIRST TIME EVERY TIME! I’m torn between the Corndogger Pro and the Chorizo Champ. Unless … holy crap … could I put chorizo in the Corndogger?!? Gonna want that cookie jar. 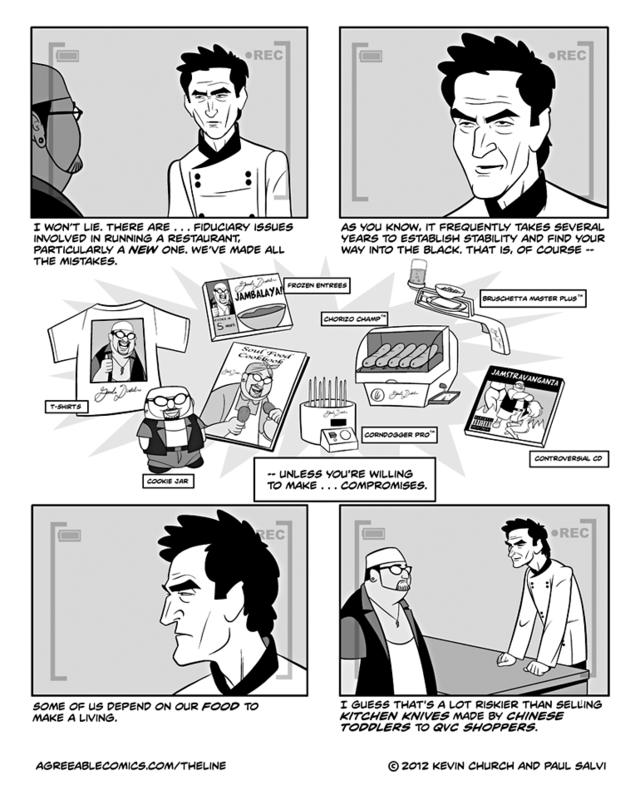 I’m a Chef, and I love your web comic. This is possibly the best potrayal of what it is really like to be a chef. The Merch Montage is fantastic! Controversial CD? I’d give it a listen, maybe.